After trying broccoli rabe for the first time, I had to try at least one other recipe to use up what was left. 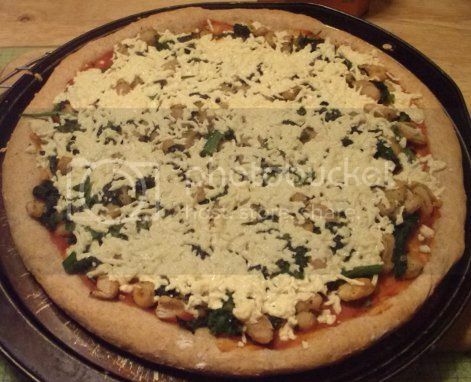 Frankly, I could have steamed the rest of the bunch and eaten it all myself, but it turned out that 1,000 Vegan Recipes had a pizza recipe with broccoli rabe that sounded pretty darn good. A lot of Robin Robertson’s pizza recipes forgo “cheese” entirely, and this was one of those recipes. It didn’t include sauce, either. 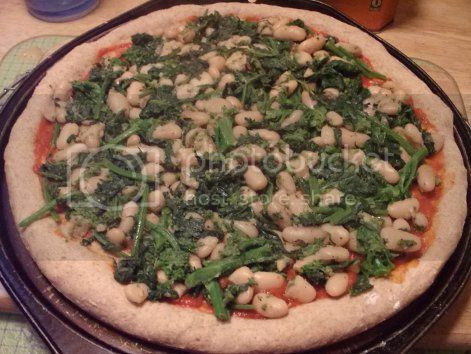 Pretty much the only ingredients other than pizza dough were garlic, white beans, and broccoli rabe. A good combination, to be sure, but with few exceptions I prefer a pizza with a bit more to it. I also didn’t like the idea of boiling the broccoli rabe, so the first change I made to the recipe was to steam it instead, just until it turned bright green. I decreased the oil by half, too, since 2tbsp seemed excessive for sauteing the toppings. After that, I did add sauce and a cup or so of Daiya mozzarella. The recipe suggested giving the pizza a kick with some red pepper flakes, so I sprinkled a few of those on as well. 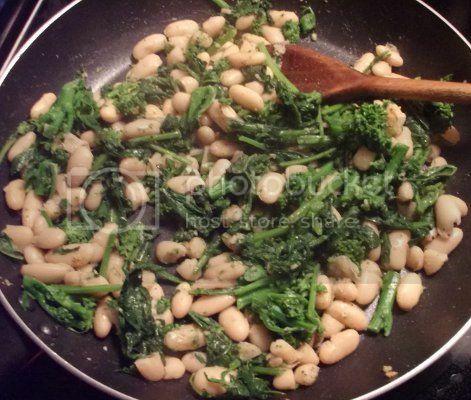 I was pretty eager to see how the broccoli rabe would taste once everything came together. Not. Disappointed. At all. This was a seriously amazing pizza! I don’t know if I mentioned it before, but broccoli rabe has a flavor that reminds me very much of something else I can’t put my finger on. Whatever it is tastes great on pizza. 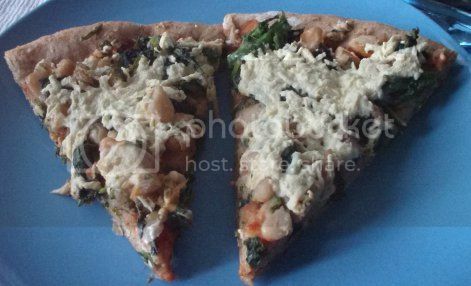 I’m a big fan of beans on pizza, too, and white beans were a good addition in this case. They gave the pizza texture and provided a lighter flavor as a backdrop to the strong taste of the broccoli rabe. Next time there’s a broccoli rabe sale, this is definitely the first thing I’m making! That pizza look amazing, I love broccoli. YUM! Looks a like a perfect complete meal!